branding accessories for all ages. Easy-fitting & comfortable with a broken-in feel. Stand up tall with traditional styling & crisp lines. Cool & sporty, great for the course or the park. Stay comfortable and cool with Ashton-approved trendy mesh. Baseball caps are as American as apple pie, but just a bit better for your waistline — and for your bottom line, when you order promotional baseball caps from Pinnacle Promotions. They’re not just good for saving the world from bad hair days. Personalized baseball caps are a cost-efficient and effective way to spread the word about your business and your brand. We can print or embroider your company’s name and logo on custom baseball hats quickly and at a budget-friendly price. Our dedicated account teams will take your order personally and ensure that you get what you need, how you need it, and when you need it. Why should you order custom baseball hats as part of your marketing strategy? You’ve passed plenty of trade show booths where the giveaway was something cheap, flimsy, and forgettable. But promotional baseball caps are different. They stand out. They’re memorable, and they’re incredibly effective as marketing tools. Personalized baseball hats are worn by people of all ages and backgrounds. These branded caps never seem to go out of style. And passersby can’t help but read what’s printed on custom baseball caps. Give them to your customers, and they’ll market your business everywhere they go, spreading the word without saying anything. Put them on your employees, and they’ll look like a unified team. Pinnacle Promotions can help you find the perfect colors, styles, and textures for your promotional baseball caps. We have custom fitted baseball hats, custom team baseball hats, and custom wool baseball caps for adults and children. Our unstructured caps are easy-fitting and comfortable, with a broken-in feel. Our structured caps feature traditional styling and crisp lines. 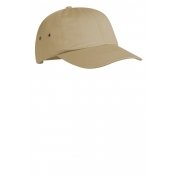 Our performance caps are perfect for golf and other outdoor activities. And our trucker caps keep you looking and feeling cool. So give us a call today, and let Pinnacle Promotions — a leader in the promotional marketing industry — set you up with the perfect promotional baseball caps for your business, your brand, and your budget.